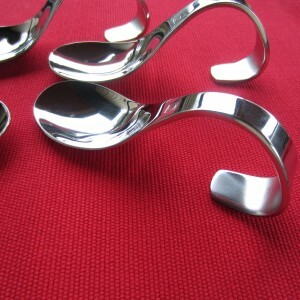 Curly Tapas Spoons~ What is Tapas? So what’s all the buzz about Tapas? For me, it’s a fun dinner sharing various small plated food with friends. 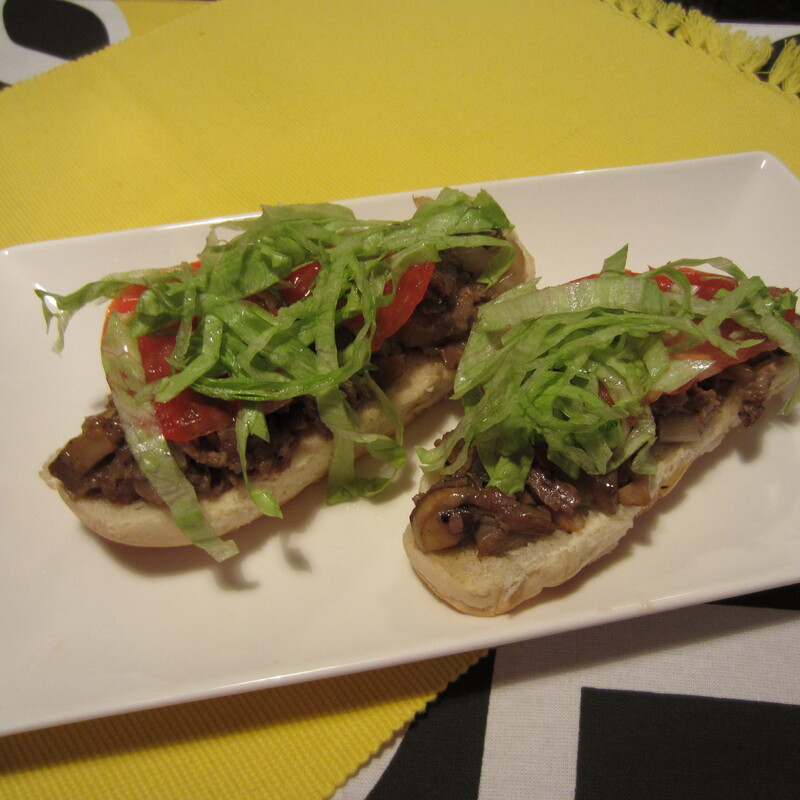 The term “Tapas” refers to “small plates”, like appetizers or sample dishes. A perfect mix when served with great wine and hanging with people you love. My first experience at a Tapas restaurant was in Grand Rapids, Michigan (just across from the Amway Grand Hotel). I was in awe. All these small plates were delivered to our table with the opportunity to sample and taste so many different foods. Ever since then, I am a big fan of Tapas dining. I recently ordered the above spoons to use at some of our Tapas dinners. 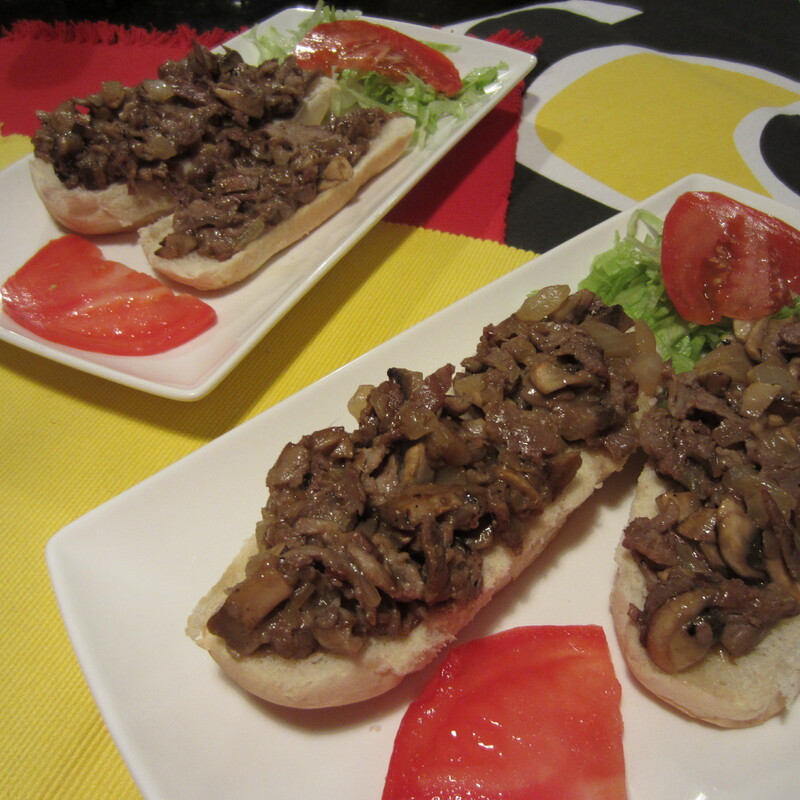 A tapa is not a particular type of food, but rather a way of eating it. Tapas is best defined as the tradition of enjoying small portions of different appetizers and finger foods. Every year we do a “Tapas Dinner” with a party of 10 friends. 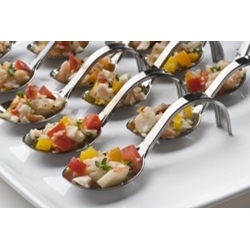 It’s a great way to sample many different foods without preparing a main course. My most recent Tapas food experience was on our annual house boat trip to Lake Cumberland in Kentucky. On our farewell dinner, each couple prepared a Tapas dish to share with the couples. My honey and I made a Beef Wellington dish. So fun and a great time creating a sampler dish. 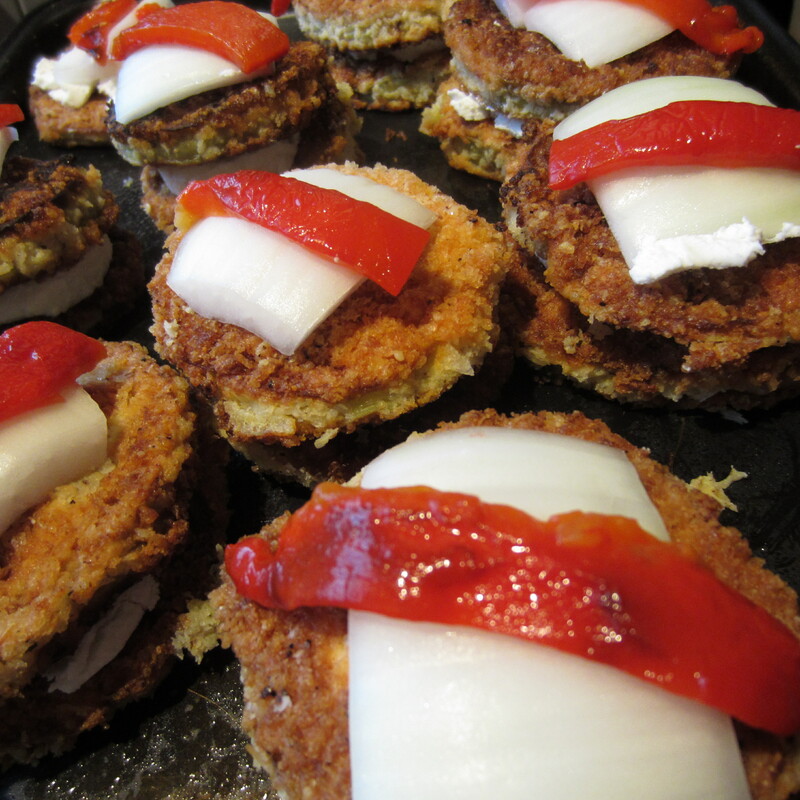 One ounce of rich, creamy goat cheese sandwiched between two layers of crusted eggplant. A slice of roasted red pepper and roasted onion tops the sandwich. 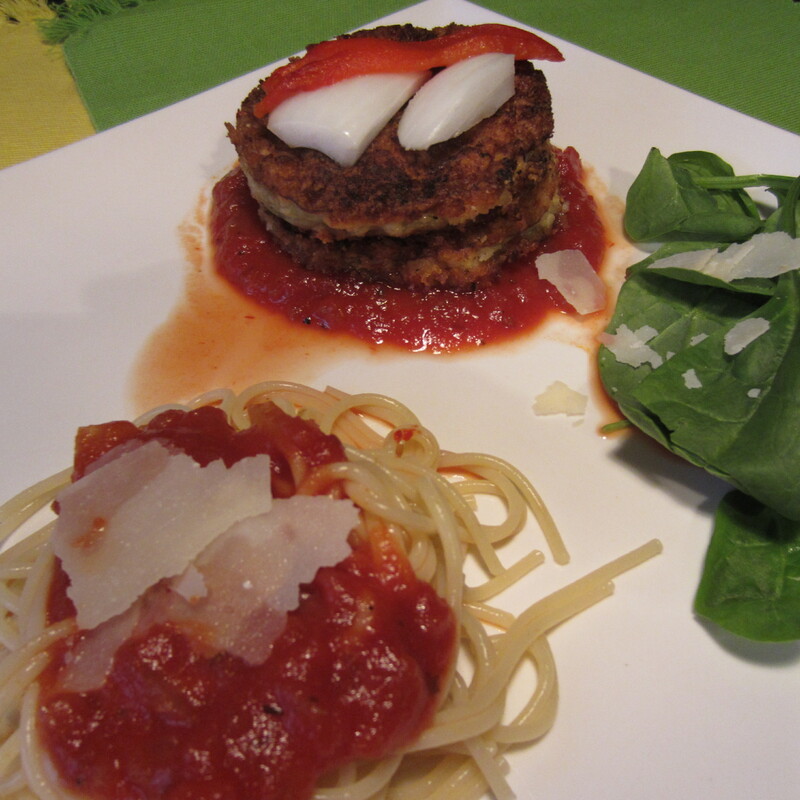 The pureed red sauce is flavored with tarragon and a smidgen of sugar. I’ll get the recipe posted in the next day or two. This is a recipe worthy of keeping in your “favorite” file. Rave reviews on this sandwich. Thinly sliced strip steak (leftover from last night’s dinner) with sauteed mushrooms and onions. Throw some Provolone cheese, lettuce and tomato slices into the mix and you have a open face sandwich to die for. The kids love racing around the house looking for their prizes. 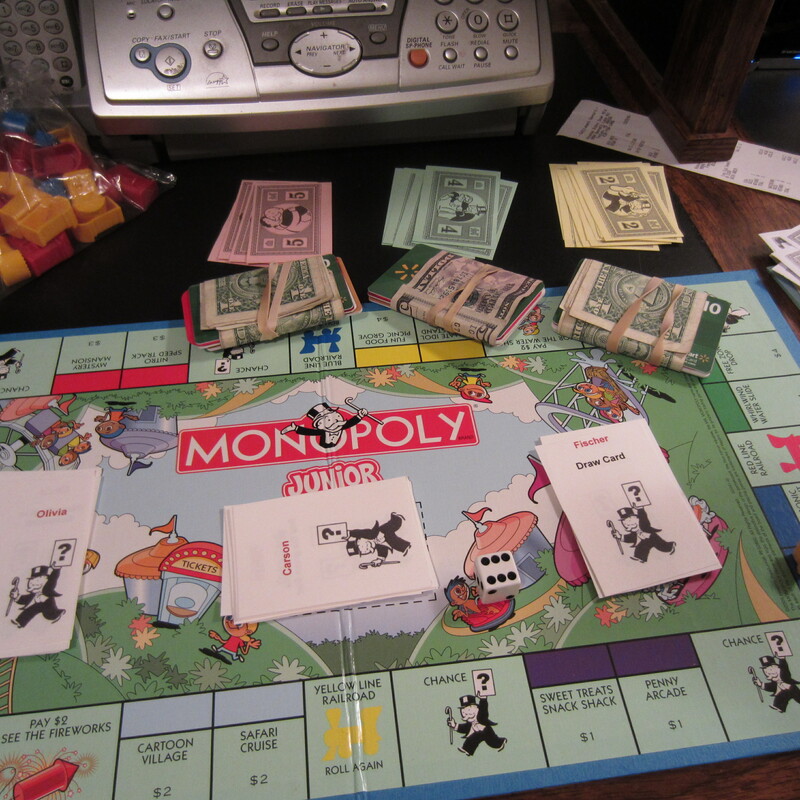 This year, I purchased inexpensive credit card holders for the kids to store their gift cards. Who needs bread when you can eat a burger wrapped in Iceberg lettuce? 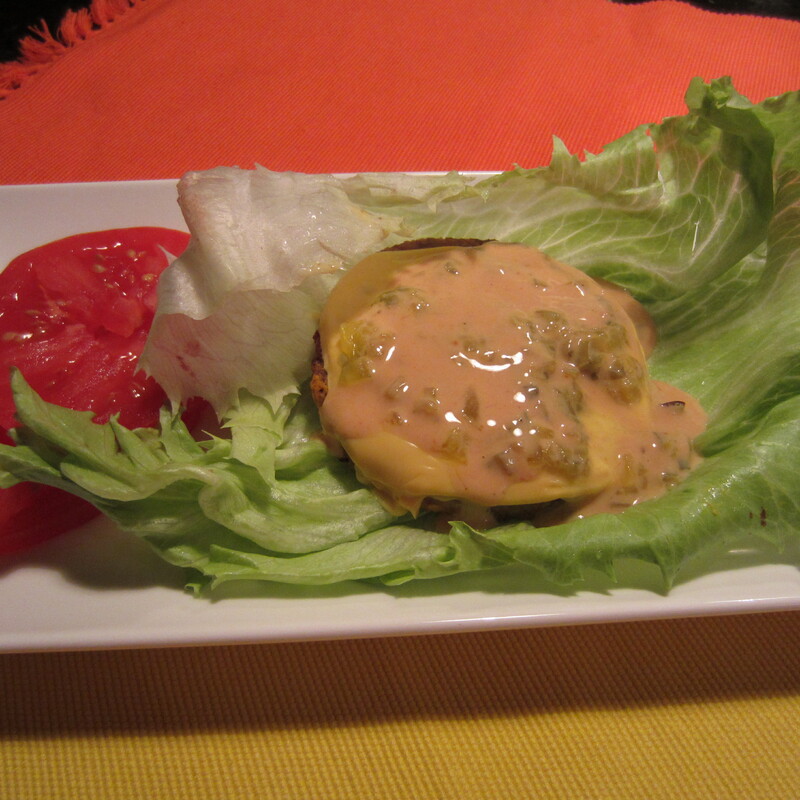 This Boca Vegan burger is topped off with low-fat cheddar, tomato, fat-free thousand island dressing, dill pickle relish, mustard and onion. A 10 minute lunch on the fly. A mere 165 calories. If you want to add a bun, use a 100 calorie Slimwich Bun. That still keeps your cheeseburger well under 300 calories. Heck, you can even add a dollop of ketchup if you want. Recipe coming soon! 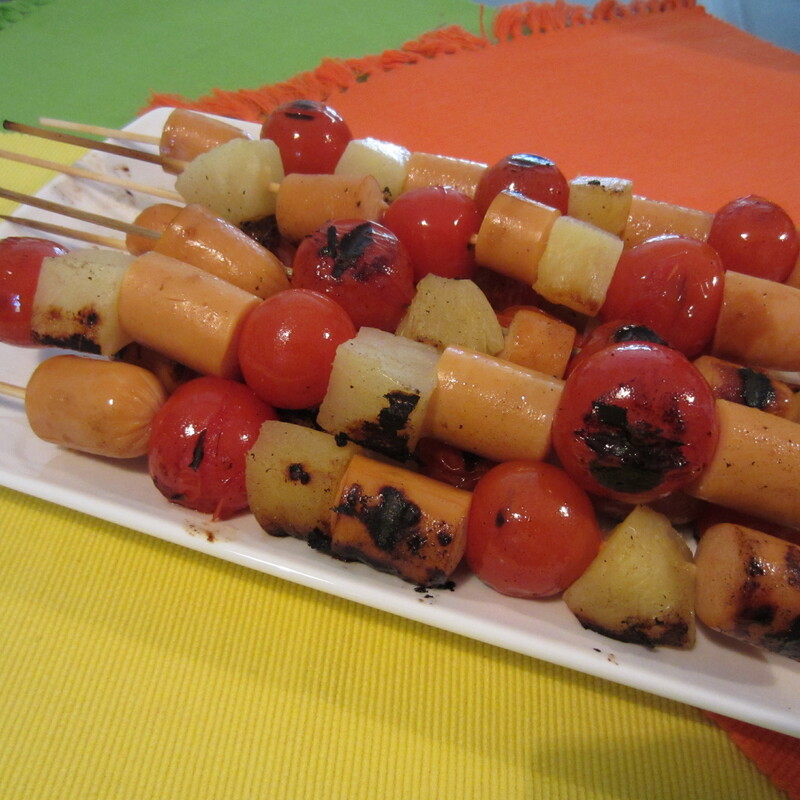 Gourmet Hot Dog Kabobs. You could easily add mushrooms and onions to the skewers with very few calories. I’m serving these tomorrow for my daughter’s daily BG (Blimpy Girl) lunch. I tend to eat alot of chicken on my Blimpy Girl eating plan. Problem is, it can get boring. I’m always experimenting with new ways to make it a bit more exciting. Chicken breast on its own is fairly bland and dry unless you jazz it up a bit. 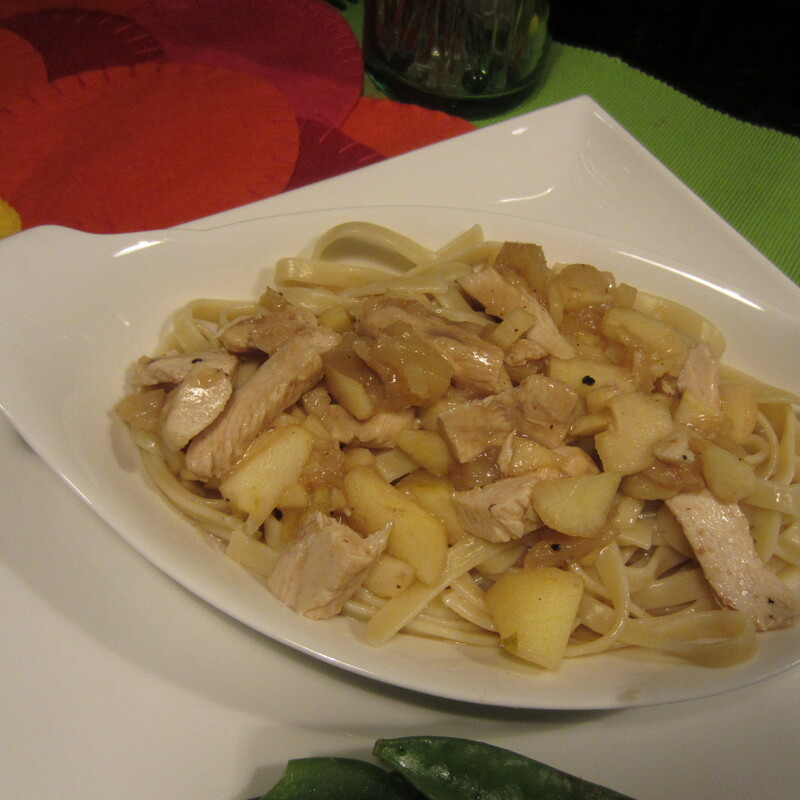 Here was last night’s dinner, Pineapple-Apple Chicken over fettuccine noodles. The steamed baby snap peas were an added bonus. I was able to make four servings from this recipe. However, I eat smaller portions, so if you have a hungry guy in the family, you may only get 2-3 servings. This recipe was sent to me by a good friend. I’m not the biggest fan of pumpkin but I wanted to give it a try. I was intriuqed about a pumpkin flavored quiche. I had 3 taste testers, myself included and here was the verdict. 1) Taste tester #1 (my daughter’s nanny). She LOVED IT!! Thought it was deserving of some low-fat whipped cream. 2) Taste tester #2 (the honey-man). He said he would prefer pumpkin pie. 3) Taste tester #3 (myself). Thought it was a little boring in flavor. 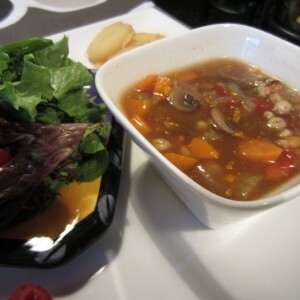 Over the weekend, my honey-man (the wine guy) made a batch of beef barley soup. Tender beef chunks mixed with potatoes and barley screamed, “eat me ‘cuz I can bring comfort”. Comfort? Exactly what is comfort food and how did that term evolve. Got me thinking and here is my take. Comfort food is personal to your upbringing. In my childhood, I remember coming home after Sunday morning church to the smell of a pot roast cooking in the oven. To this day, the smell and taste of a pot roast, at least in my mind, brings comfort and evokes so many good memories. On the other hand, there are salmon patties. It was not a childhood favorite. I gag on the smell alone. Certainly not a comfort food by any stretch of the imagination. Maybe because my mom made me sit at the dinner table until it was all gone. Thank God for big paper napkins (and a family pet who willingly devoured the chunks I left beneath the table). Comfort food is likely food you won’t find on a three star restaurant menu. It’s generally food with smells and taste that evokes pleasant memories. Fried chicken reminds me of my Grammy. No one cooked Southern fried chicken like she did. The smell of battered chicken cooking in hot oil takes me back in time. It evokes feelings of nostalgia, safety, and security. At least that’s my take. I think many people find comfort in reconnecting with foods from their earlier years, hence… “comfort” food. We all have are own agenda when it comes to classifying what we consider comfort foods. Here is my personal top 10, what are some of yours? This dense portion is chock full of veggie goodness. Hmmm…. 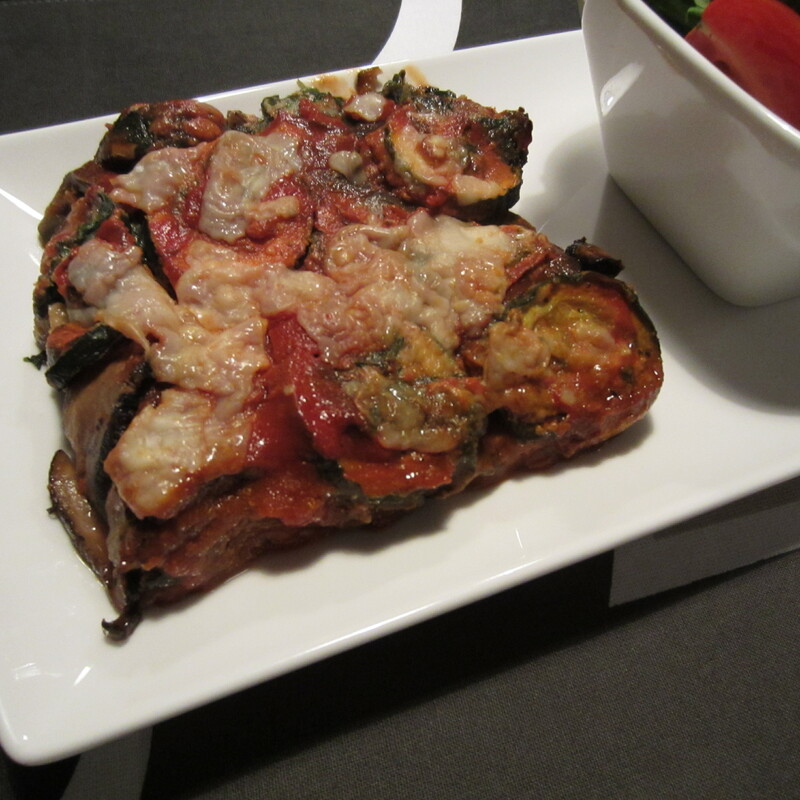 let’s see… eggplant, spinach, zucchini, portabella mushrooms…. PLUS cheese. 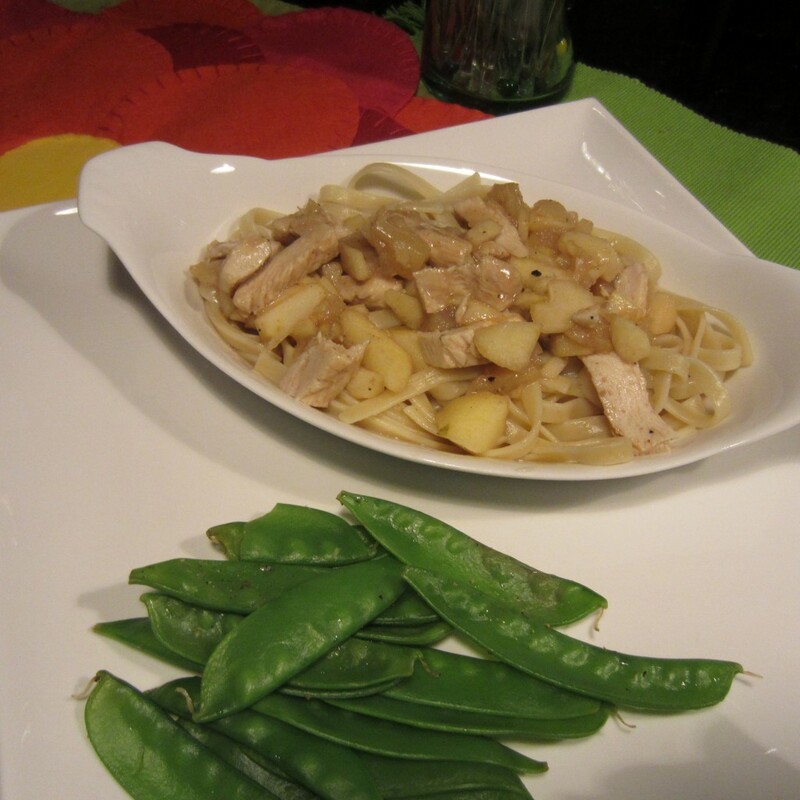 This portion size packs a powerful punch with less than 200 calories per serving. It’s filling and packed with yum-yum. 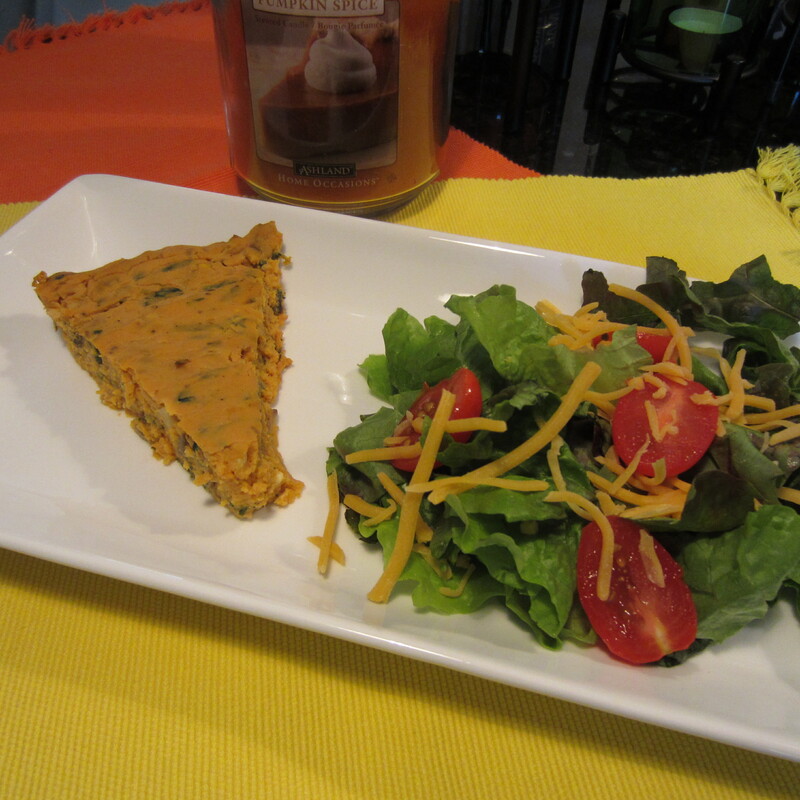 Serve with a small side salad and low-cal salad dressing.